“Virtuosos on clarinet and saxophone” (New York Times), Will Anderson was born and raised in Washington D.C., and moved to New York City to attend The Juilliard School. He's performed with the Jazz at Lincoln Center Orchestra, Vanguard Jazz Orchestra, Wycliffe Gordon, Cecile McLorin Salvant, Paquito D’Rivera, Wynton Marsalis, Frank Vignola, and can be heard on the 2014 Grammy-winning soundtrack of HBO’s Boardwalk Empire with Vince Giordano’s Nighthawks. With his twin brother Peter, Will has headlined at The Blue Note, Jazz at Lincoln Center, The Kennedy Center, New Orleans Jazz Festival, Feinstein’s 54 Below, Arizona Music Festival, Princeton Festival, Syracuse Jazz Festival, Sarasota Jazz Festival, Hilton Head’s The Jazz Corner, San Francisco’sJazz at the Ballroom, The Louis Armstrong House Museum, Iowa’s Bix Beiderbecke Festival, and live on Garrison Keillor’s Prairie Home Companion Radio Program. The Andersons have performed in over 40 U.S. states, throughout Brazil, Japan, the U.K., and six times in NYC’s famed Highlights in Jazz series, alongside Lou Donaldson, Jimmy Heath, Ken Peplowski, Steve Turre, Warren Vache, and Jimmy Cobb. Vanity Fair magazine listed their debut album, Correspondence, featuring Kenny Barron, alongside Miles Davis in “Four New Releases to Make You Love Jazz,” and the Washington Post called their music “imaginatively unfolding in ways that consistently bring a fresh perspective to classic jazz.” Peter and Will received a 2014 Drama Desk nomination for their Off-Broadway Production, Le Jazz Hot (one of seven productions at 59E59 Theaters), and in 2018 were Bistro Award winners. Their 2014 album, Deja Vu, was called “a burner that reveals the band’s cohesiveness and spirit” (JazzTimes). 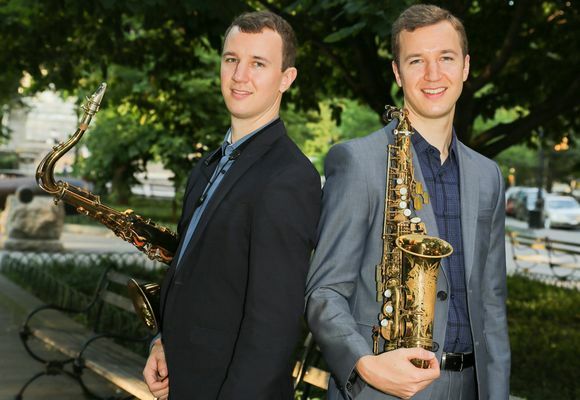 Last year, the Andersons raised $25,000 to establish the Joe Temperley Juilliard Student Scholarship Fund and tribute album in honor of their late great saxophone mentor. Peter and Will are teaching artists through Juilliard’s Nord-Anglia program, conducting school workshops in Orlando, Charlotte, Washington D.C. and Chicago. They’ve lectured at over 100 high schools countrywide and Universities including Michigan State, Ohio State, Florida State, Temple, Xavier, Scranton, South Florida, Lenoir-Rhyne, Central Oklahoma, Jacksonville and in Nagasaki, Japan.